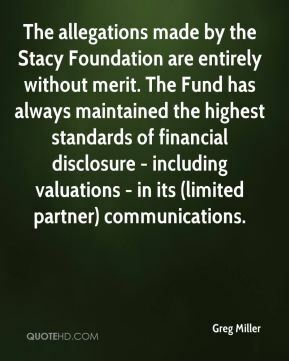 The allegations made by the Stacy Foundation are entirely without merit. The Fund has always maintained the highest standards of financial disclosure - including valuations - in its (limited partner) communications. 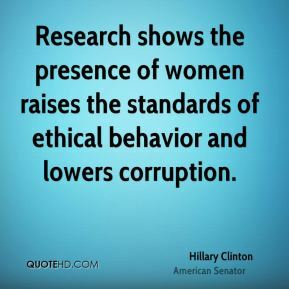 These are standards you need in today's modern world. 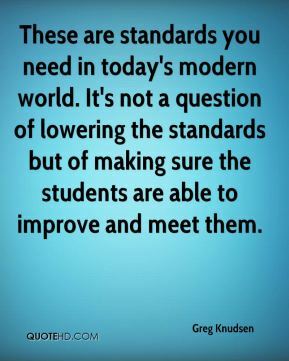 It's not a question of lowering the standards but of making sure the students are able to improve and meet them. 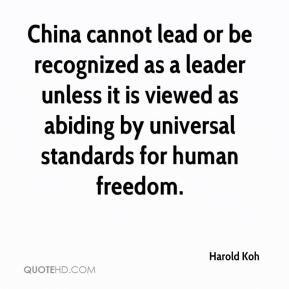 China cannot lead or be recognized as a leader unless it is viewed as abiding by universal standards for human freedom. No. 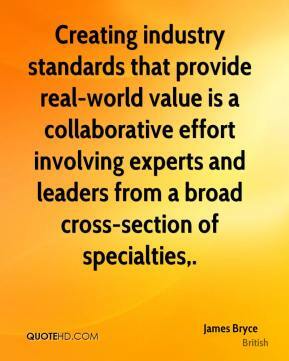 1, whatever we do is standards-based, so there is no vendor lock-in for the customer. 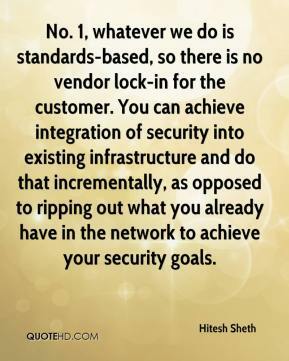 You can achieve integration of security into existing infrastructure and do that incrementally, as opposed to ripping out what you already have in the network to achieve your security goals. 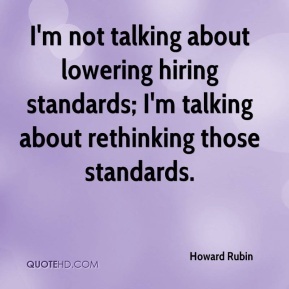 I'm not talking about lowering hiring standards; I'm talking about rethinking those standards. The level we have at the moment is essentially the same as high school content standards. 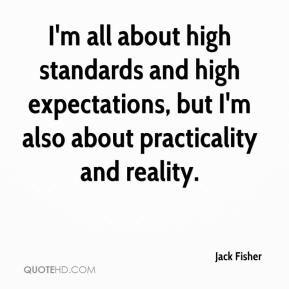 I'm all about high standards and high expectations, but I'm also about practicality and reality. 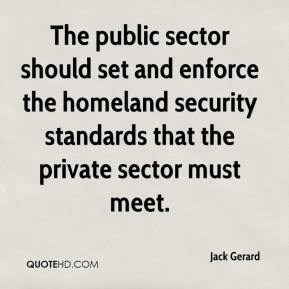 The public sector should set and enforce the homeland security standards that the private sector must meet. 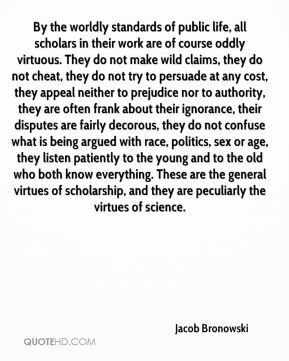 All the arguments inserted in the standards are only found in the literature of intelligent design. 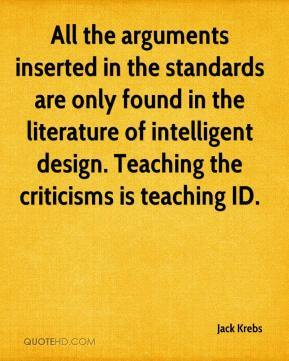 Teaching the criticisms is teaching ID. 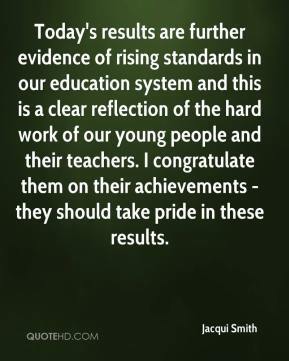 Today's results are further evidence of rising standards in our education system and this is a clear reflection of the hard work of our young people and their teachers. I congratulate them on their achievements - they should take pride in these results. 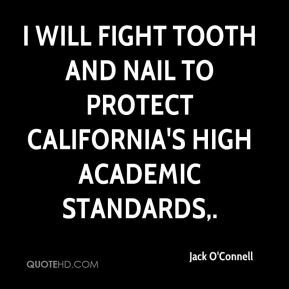 I will fight tooth and nail to protect California's high academic standards. 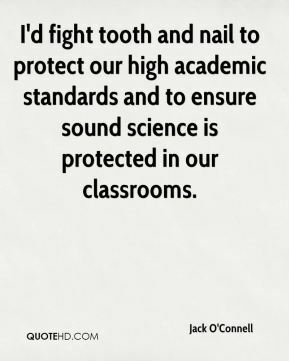 I'd fight tooth and nail to protect our high academic standards and to ensure sound science is protected in our classrooms. There are no sure answers for ice being safe. 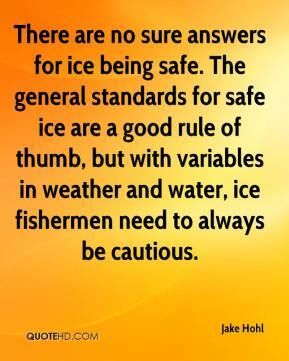 The general standards for safe ice are a good rule of thumb, but with variables in weather and water, ice fishermen need to always be cautious. 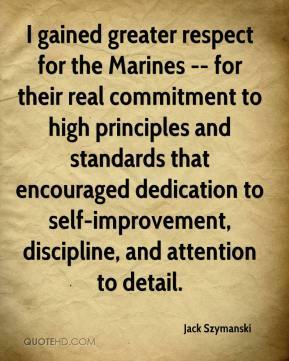 I gained greater respect for the Marines -- for their real commitment to high principles and standards that encouraged dedication to self-improvement, discipline, and attention to detail. 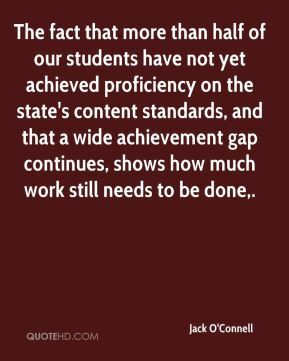 The fact that more than half of our students have not yet achieved proficiency on the state's content standards, and that a wide achievement gap continues, shows how much work still needs to be done. 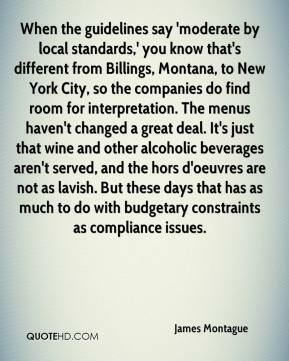 When the guidelines say 'moderate by local standards,' you know that's different from Billings, Montana, to New York City, so the companies do find room for interpretation. The menus haven't changed a great deal. It's just that wine and other alcoholic beverages aren't served, and the hors d'oeuvres are not as lavish. 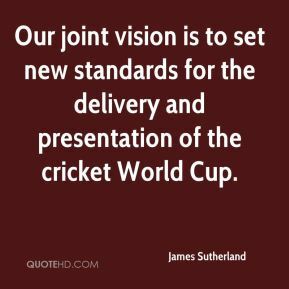 But these days that has as much to do with budgetary constraints as compliance issues. 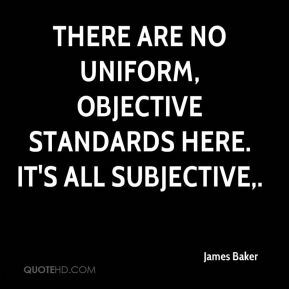 There are no uniform, objective standards here. It's all subjective. 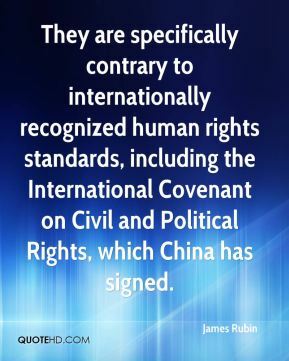 They are specifically contrary to internationally recognized human rights standards, including the International Covenant on Civil and Political Rights, which China has signed. 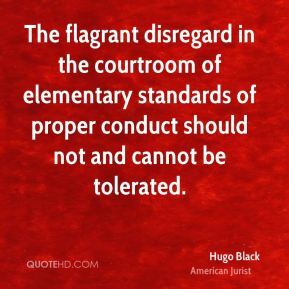 We have higher standards for teachers. 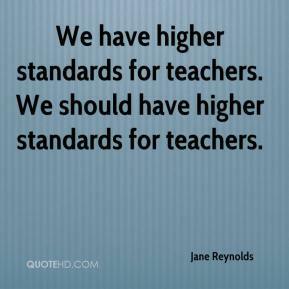 We should have higher standards for teachers. The US has long taken a selective approach to international standards, but in recent years, the US government has taken unprecedented steps to disregard its obligations under international treaties. 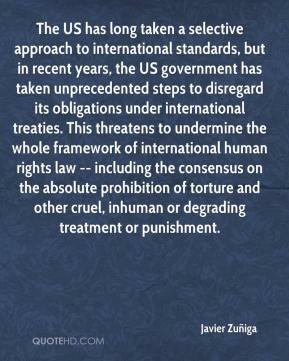 This threatens to undermine the whole framework of international human rights law -- including the consensus on the absolute prohibition of torture and other cruel, inhuman or degrading treatment or punishment.